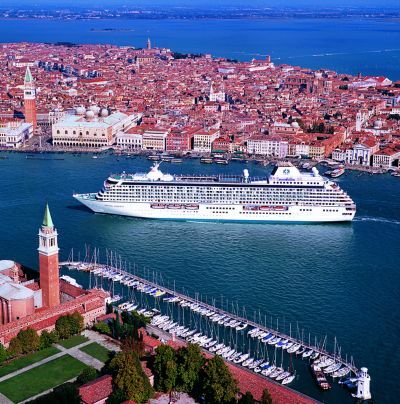 Crystal Cruises could be said to be the world’s smallest serious cruise line, and by the same token one of the largest. The company, which created the title “Six-Star” cruising is certainly worth the description. Crystal now has only two ships, Crystal Symphony (1995 – 51,000 tons – 960 passengers) and Crystal Serenity (2003 – 68,000 tons – 1,100 passengers). Whilst managed hands on from Los Angeles the company is owned by Nippon Yusen Kabushiki Kaisha or NYK Line, itself part of Mitsubishi, and one of the world’s largest shipping companies with over 500 vessels. Crystal has won more awards than most. When launched 20 years ago the cruise industry as we know it today was in its infancy. In the main, the ships in the luxury top end of the market were converted liners, with very few offering anything in the way of balcony cabins and with limited amenities. 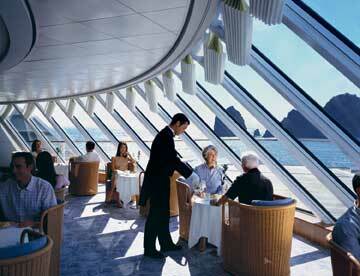 Crystal Harmony, a one-class vessel designed exclusively for worldwide cruising, changed all that. At 50,000 tons, then and now, it can be classed as a medium size ship. Such is the size of NYK it has moved on and plies the seas as the Japanese Asuka II. Our review is of Crystal Serenity which differs from her sister ship in having two swimming pools, one covered by a sliding glass roof, ideal for less equitable climes but in fact usually kept shut. The air conditioning is excellent. Called the Neptune Lounge the area is ideal for lunchtime buffets and also less posh evening dining. On Crystal people tend to dress up for dinner, especially for the formal nights. Wherever you choose to eat the cuisine is superb and you can dine off the menu too. No charge of course. First impressions count and there is a welcoming drink when stepping on board. You are escorted to your stateroom and introduced to your steward. If there is a weakness with the ships the standard cabins are not as spacious as some of the latest but every one of them has a full bath. The ship has three sets of elevators with the main public areas either down towards the waterline, or high up on the top decks. That makes it easy for getting about and remembering where your cabin is. The central atrium area features The Bistro for morning coffee and afternoon tea plus simple dining, the Crystal Cove bar, and various management facilities. 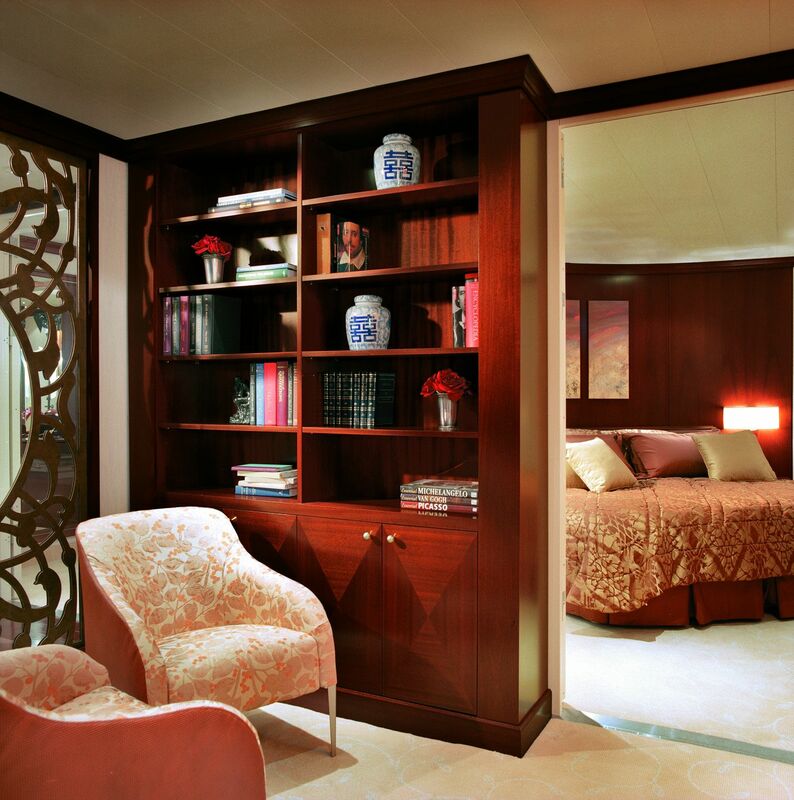 Up on the top deck is the splendid Palm Court lounge and one of the nicest rooms afloat. 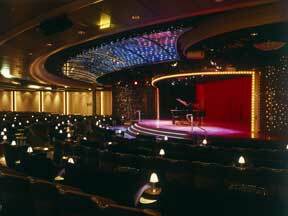 The ship has a full covered promenade deck at about four laps to the mile. You can dine privately on your balcony during restaurant opening hours with a full bill of fare to choose from, and there is an excellent 24hr menu if you are out of sequence. Again there are no charges for this service and in fact the extras’ bill can be very limited. The penthouses are outstanding in their layout, and offer a 24hr butler service and various complimentary offerings including wines and spirits. For everyone soft drinks are provided gratis. Cruising is now very competitive price-wise and Crystal has been innovative in introducing various incentives including wine for dinner, complimentary laundry and on-board credits. Watch out for what is on offer. In the casino you can try and win enough to cover the next trip. It’s been done many times. When it comes to dining it is here that Crystal really scores. Serenity offers the traditional two sittings in the main and very spacious Crystal Dining Room but a new innovation for 2011 is Perfect Choice Dining an innovation in the ultra-luxury sector of the cruise industry. Offered complimentary, Perfect Choice Dining maintains Crystal’s classic dining experience but allows guests to dine when and where they choose. If that is not enough for you Prego is without doubt the finest Italian restaurant at sea. For connoisseurs of eastern cooking Silk Road features the eclectic cuisine of famed master chef Nobuyuki “Nobu” Matsuhisa with entree and dessert dishes prepared by Nobu-trained chefs. There is a Sushi bar as well. You can of course take breakfast in the dining room but should you prefer the lido café waiting staff are on hand to take your tray or even serve you at the table. It is all very relaxed but extremely courteous. The company has a rule that all members of the staff must deal with a traveller’s question in the first instance, whoever you are. We asked a member of the crew what time we were docking at the next port of call. He said he did not know and went off to find out. Later we discovered he was the ship’s doctor. It is this quality of service that makes Crystal different with a passenger crew ratio of 1:7. If you are sitting out on the spacious stern deck having breakfast (or lunch) you can be sure a watchful member of the crew is ready to assist with your needs. The Vintage Room on Crystal Serenity hosts the ultimate experience for wine enthusiasts with intimate wine-makers’ dinners for four to 14 people (nightly by reservation), offering a tasting menu created to complement rare vintages and wine regions of the world. 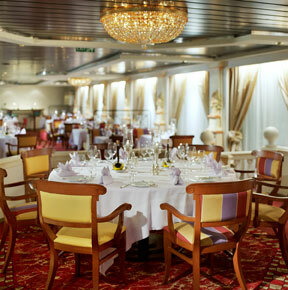 The dinners are offered several times each cruise for approximately US$200+ per person, depending on the wines chosen. Crystal, for the most part, tries to offer as many sea days as possible. On these days there is a whole series of (gratis) onboard activities including a Yamaha keyboard class, Computer University at Sea, golf instruction, poker, hands on cooking, and the Hollywood Theatre, always popular and used for not only the latest film presentations but also for lectures, described as “Enrichment seminars”. 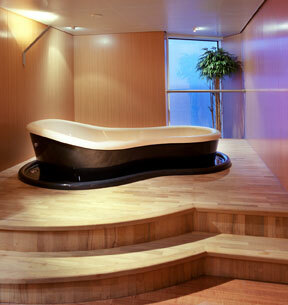 Not free is the Steiner spa where you can pamper yourself with some exotic treatments. The ship really comes to life in the evening with merriment and noise from the Starlight Club, Avenue Saloon and of course the Galaxy Lounge for Showtime, entertainment to the highest standards, worthy of London’s West End. THE SHIP’S PROGRAMME 2011: Crystal Serenity is presently on a world cruise which started at Los Angeles on 17 January and then routed westward, completing at Dover on 8 May. About half the passenger complement are taking the full cruise. Crystal very sensibly offers the world cruise in seven distinct sectors, ranging from 12 to 21 days. Some people get off and then re-join, whilst for others it is just one or two sectors. Auckland to Sydney (28 February) includes most of the major New Zealand cities, plus Hobart and Melbourne. Serenity then routes via Bali to Singapore (15 March), the next sector includes Bangkok, Colombo, Cochin and Mumbai. Via the Indian Ocean islands, Durban and Port Elizabeth are followed by Cape Town (17 April). Dover is then 21 days away via various West African ports and Lisbon. Starting out at Hamburg on 22 May Crystal Serenity embarks on a series of Northern Europe 11/12 day cruises, initially based at Copenhagen and Stockholm and as the summer continues via most of the major Mediterranean ports including Barcelona, Rome, Venice, Athens and Istanbul. Crystal Serenity completes the year with a transatlantic crossing from Lisbon (8 December) to Miami (21 December) from which it embarks on a lazy 14-day holiday cruise around the Caribbean before returning to the Florida port. Departing 18 January 2012, Crystal Serenity will embark on a round-trip from Los Angeles, exploring 35 ports in five segments through Hawaii, the South Pacific, Australia, Indonesia, Southeast Asia, China, Japan, Russia, Alaska, British Columbia and San Francisco. Carnival Spirit is to be based full time in Australian waters from October 2012. The 85,000 ton 2,667-passenger ship will be the first Carnival vessel permanently operating outside of the United States. Sydney has been chosen as the home port, the only problem being that the ship cannot get under the famous harbour bridge. Circular Quay will be used. Itineraries are yet to be revealed, but it is likely that cruise lengths will be between eight and 12 days taking in the Pacific Islands and also probably calling at New Zealand ports for part of the year. Cunard staged a remarkable winter firework display on Thursday 13 January in New York when its three Queens met up for the first time. 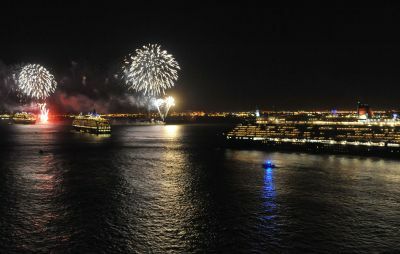 The rendezvous of The Queen Mary 2, The Queen Victoria and The Queen Elizabeth was only the second time in the company’s 170-year history that the entire fleet was in New York at the same time. The Queens’ rendezvous was marked by 20 minutes of fireworks from two locations, with the Statue of Liberty serving as a backdrop. New Yorkers turned out en masse to see the ships including specially chartered boats, and those taking advantage of the free Staten Island ferry. Fred Olsen’s cruise ship, Balmoral, will host a very special ‘Around the UK’ cruise in August 2011. A dedicated package for keen gardeners is offered on this cruise. On board will be some of the best-known celebrity gardeners in the UK, giving talks and gardening tips, and answering guests’ questions. They are Alan Titchmarsh, broadcaster, novelist, journalist and gardener; Adam Pasco, Editor of Gardeners’ World Magazine; Pippa Greenwood and Matthew Biggs, both regular contributors to the popular magazine and panellists on BBC Radio 4’s Gardeners’ Question Time. Frommer’s Cruises and Ports of Call has been published. It is not a competitor to the even longer established Berlitz Cruising and Cruise Ships, more of a companion volume and just as useful. It does rate the boats but in design and layout it is completely different with ships divided into what it calls “classes” although where it is an individual vessel it gains a comprehensive review. Virtually every major cruise operator is mentioned but it is a US book and whilst Cunard is well covered, P&O seems not to exist. Holland America is included (maybe it is the “America” that makes for an entry) as does Swedish-owned Monaco-based Star Clippers. Work that one out. All the American departure ports are well covered in the style Frommer’s are noted for, as are the Caribbean destinations plus Bermuda and The Bahamas. No mention of Europe at all! Guernsey does not have a proper full size port, not one at least big enough to take a cruise liner of any size. However somehow it has made itself so attractive that 76 vessels plan to anchor off the capital St Peter’s Port this coming year and disgorge one day passengers. With ships’ crew also making the most of the opportunity afforded more than 80,000 visitors can be added to the islands’ holidaymakers throughput, all keen to spend British pounds. Silversea has confirmed that that eight voyages this year will feature the popular Relais & Châteaux L'École des Chefs interactive cooking school. The curriculum for each of these cruises is carefully designed to celebrate the cultural flavour of the ship's itinerary. Highlights include specialised workshops covering a range of topics from basic knife skills and kitchen terminology to sauces and baking; cooking demonstrations with wine pairings and interactive Q&A sessions; lively cooking competitions between Chef Bilsland and the ship's own culinary team; a "Lunch and Learn" event offering small groups of guests a chance to sample a delicious meal of specially prepared dishes; and inspired "Take It Home" recipes that will give passengers an edge when entertaining at home. The UK Passenger Shipping Association has published figures that nearly 35m passengers, 8m cars and more than 140,000 coaches were carried by Britain’s ferries in 2010, which operated normally in a year punctuated with freak weather conditions that caught out other transport alternatives. Coach numbers were up by 5.6% and ferry passengers and car numbers rose factionary. Seatrade Europe will return once again to Hamburg this year after its Mediterranean sojourn in Cannes last November. Dates are 27-29 September at the Hamburg Messe Fairground. In 2009 over 4.9m passengers embarked on their cruises from a European port and over 75% of these were European nationals. With vast source market potential and some 180 ports, Europe has taken the lead in cruise market growth. Oceania’s new Marina flagship is now well on her way as AERBT is published with a maiden voyage from Barcelona to Miami. She arrives on 4 February followed by four days of showcasing and a gala launch, and then departs for San Francisco, and in the cruising traditions, celebrates her arrival at every port en route. It sounds like an exhausting but fun trip. After two US west coast round trips Marina then operates a 12-day Caribbean cruise, round-trip from Miami, departing 16 March, before sailing along the US Eastern Seaboard and on to Europe to begin her inaugural Mediterranean season. Voyages of Discovery, Swan Hellenic and Hebridean Island Cruises, all part of Roger Allard’s All Leisure Group, have all been in the news spotlight this year, with one of the biggest stories being the new summer homeport of Portsmouth for Swan Hellenic and Voyages of Discovery in 2011. Portsmouth will become a no-fly cruise embarkation point for many exciting routes and excursions in 2011, with Harwich still playing a part for Discovery on two new voyages, the historically rich Voyage to the White Sea and Archangel and the new ‘Footloose’ walking cruise Norwegian Explorer. Popular destinations in 2010 for Discovery included Asia and Indonesia and the Mediterranean remains firm favourite for Minerva, as she also enjoyed her last season in Antarctica before returning to the Far East and the Orient in November.